Think you don't have space for a home office? Think again. This modern office is tucked into a hallway and makes use of an otherwise empty space. Modern function and design come through in the Luce Chair. 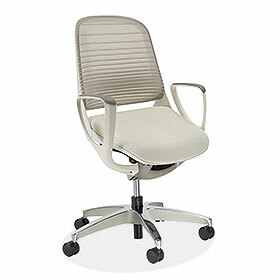 The smooth angles of this chair are eye-catching and its construction keeps you supported. Monochromatic tones work wonders in this home office. 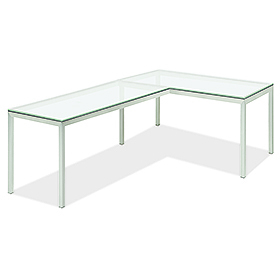 The L-shaped desk provides a lengthy surface, and its white glass top beautifully blends with this all-white workspace. A subtle picture ledge makes a great impact in this office. It adds another layer of dimension, and brings your eyes upward. 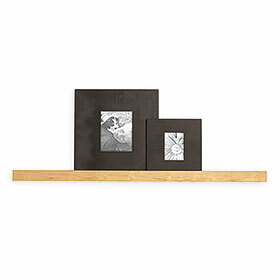 It's the perfect place to set your favorite framed memories.